Cost: $165/adult; $100/youth (ages 6-17); includes bus travel, registration fee and WMF Welcome Kit. Meals not included. Please note that Pope Francis will NOT be in Philadelphia on the day of our pilgrimage. Saint John Paul II created the World Meeting of Families (WMF) in 1994 in Rome to explore the critical role the family plays in society and to give families opportunities to talk with others about the challenges and blessings that all families have. 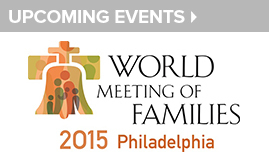 Click here for the official website: www.worldmeeting2015.org.